The Fairmont Empress is one of the oldest hotels in Victoria, British Columbia and is an iconic symbol of the city. 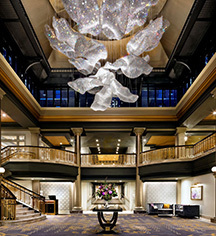 Opened in 1908, this gorgeous hotel was designed by Francis Rattenbury and overlooks Victoria's Inner Harbour. It is now designated as a National Historic Site of Canada, and recognized as one of the Top 21 Iconic Hotels in the World by National Geographic Traveler Magazine, honored by Travel + Leisure as a Top Canadian Hotel, and is a Condé Nast Readers’ Choice and Gold List Hotel. Fairmont Empress has played host to several big names over the years, in politics, entertainment, and royalty. Prince Edward of Wales, his brother and sister-in-law King George IV and Queen Elizabeth, and HRH Queen Elizabeth II and Prince Philip have all stayed at this luxury hotel. The Forbes four-star Fairmont Empress has undergone several significant renovations and upgrades, the most recent in 2017 and included a spectacular new lobby and a revitalized pool and health club. Each of the meeting spaces, restaurants, and Willow Stream Spa also saw major changes and modern amenities added. The 464 guestrooms have been beautifully restored and reflect modernity alongside the classic elegance that the “Castle on the Coast” has come to be known for. Amenities include air-conditioning, high speed internet, Keurig machines, and terry bathrobes. The Willow Stream Spa’s refreshments include a brand-new reception area, a luxury lounge, and a rejuvenation whirlpool, while the health center features new equipment and a larger pool. Known far and wide for its Afternoon Tea, Fairmont Empress also serves Pacific Northwest cuisine with a celebrated wine list of top vintages from around the globe. 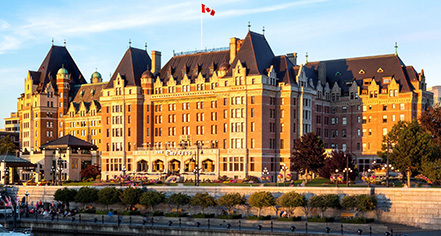 As part of the heart of Victoria’s city center, Fairmont Empress is in the perfect location for guests to experience all the grandeur of the historic locale. The hotel sits just steps away from whale watching tour providers, float plane services, the Royal British Columbia Museum, and shops on historic Government Street. It is just a thirty minute drive from the famous Butchart Gardens. Fairmont Empress, a member of Historic Hotels Worldwide since 2018, dates back to 1908. During prohibition, Sir Winston Churchill discretely enjoyed gin in the Lobby Lounge by concealing it inside a tea pot. ATM: Nearest ATM is 300 feet. Early Check-In/Late Check-Out: Based on availability; fee applies. Extra Person Fees: Extra adults $50 CAD; extra adults in Fairmont Gold $70 CAD. Hotel/Resort Fees & Taxes: 17% total taxes. Parking: Private parking, underneath the hotel; fee applies. Payment: Visa, MasterCard, American Express, Diner's Club, debit card, and cash. Pet Policy: $25 CAD per pet, per day; restrictions apply. No unattended pets allowed. Rollaways: Available upon request, with select room types. The Fairmont Empress is one of the oldest hotels in Victoria, British Columbia and is an iconic symbol of the city. Opened in 1908, this gorgeous hotel was designed by Francis Rattenbury and overlooks Victoria's Inner Harbour. Learn more about the History of Fairmont Empress .